For the question, if mFT is sufficient or if you still need a full frame system i want to share my experiences after using full frame for about 8 years now and 4 years using an mFT system. After the beginning in digital photography i started a Canon 400D, then i upgraded from a 40D to a 7D and after that i could afford a full frame DSLR, the Canon 5D MK II which i still own and use. Buying the full frame camera sort of getting me into the highest quality level. A little bit more than 4 years ago there was a wish not to carry a camera back pack with 10-12kg of euqipment all the time. The choice was easily made for the Lumix G6, which was replaced with the Lumix G81 after 4 years. 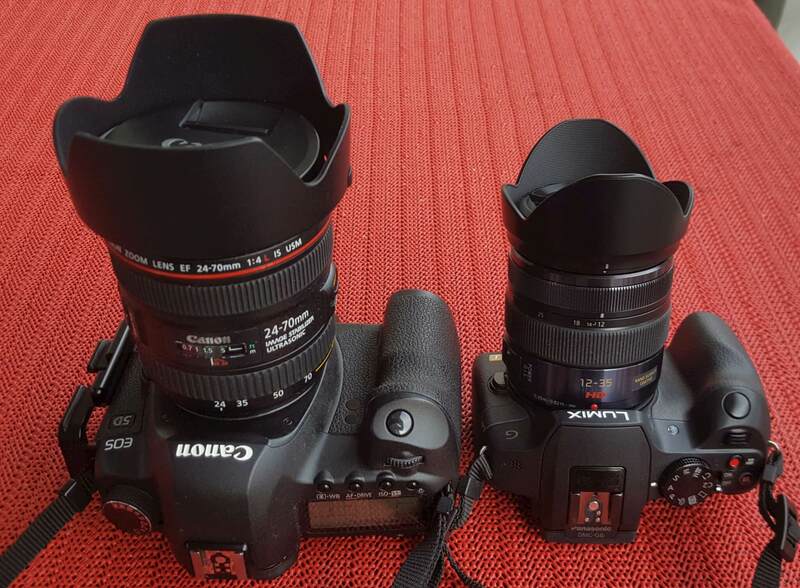 If you take a look on my equipment list you’ll might notice that both the lenses for full frame and for the mFT camera cover up (almost) the same focal range, even though the standard zooms for the mFT system both start with an aparture of f 2.8. I already did a size comparism between the Lumix G6 as a mFT system camera and the full frame Canon 5D MK II. 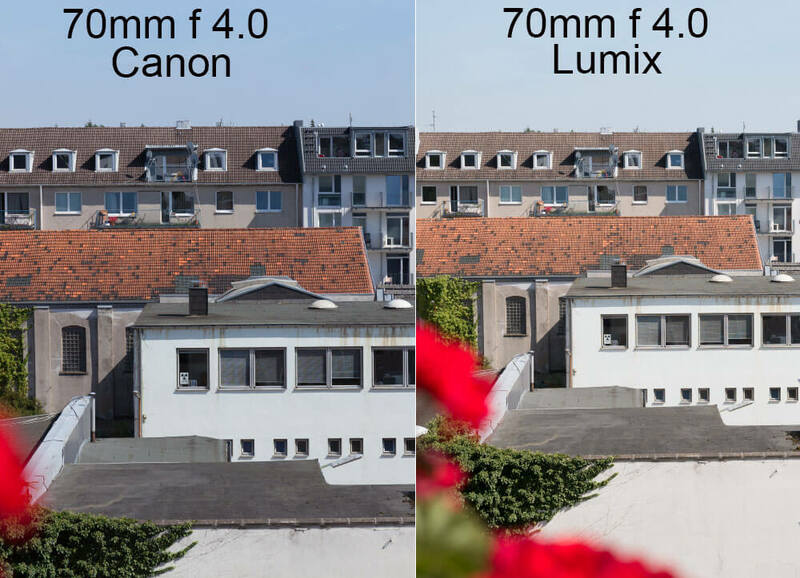 This comparism still is valid, because the Lumix G81 is only a little bit bigger. On the other hand the 35-100mm/2.8 zoom lens which replaced my 45-150mm doesn’t increase size because of zooming towards the maximum focal length. Just taking a base equipment like my Canon 16-35mm/4.0 L, 24-70/4.0 L and the 70-200mm/4.0 and in addition the 100mm/2.8 Macro an equivalent mFT system will save arround 2.5 kg in weight. On the other hand features built-in into a Lumix G81 could be the determining factor for switching to mFT system, if you think about the display which replaces a angel-finder for takeing picture close to the ground. 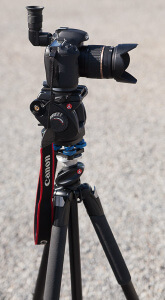 In addition the Lumix offers a stabalization systems also in the camera body, which ensures longer exposure times without the need for a tripod. And least think about the video capabilites on a Lumix G81 and compare it to even a mondern 5D MK IV or the newest EOR-R mirrorless camera from Canon. 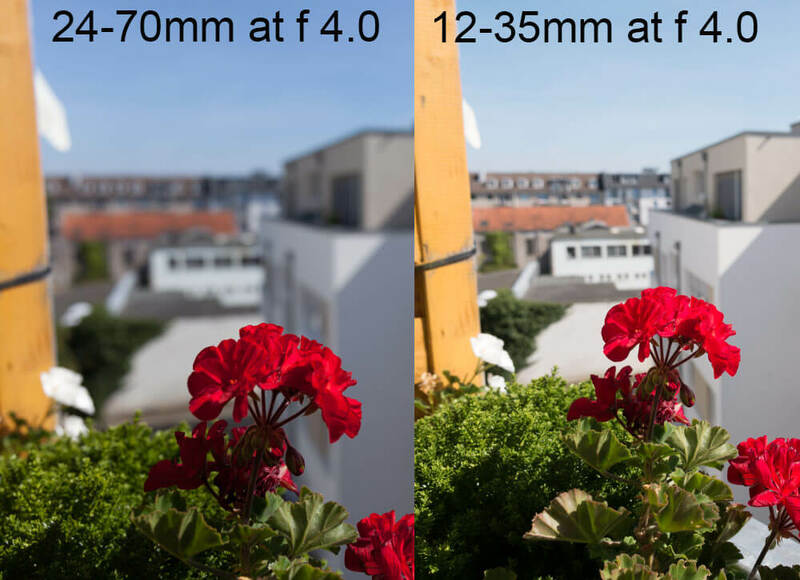 The difference is not that big as the most depth of field calculators might say, but the effect is noticeable. If you soot portraits and like to have the eyes in focus and the eyelashes being out of focus you’ll be better off with a full-frame camera and lets say a 85mm/1.2 lens. But this doesn’t mean, you can’t do beautiful portraits with a mFT and a 45mm/1.8 lens. Comparing the results you’ll find out that noise behavior is better on a full frame camera by arround 2 EV. But in another article i stated that noise also depends on the image itsself, basically on larger monochrome areas in the picture (red,blue) Depending on the image you shouldn’t fear higher ISO settings like even ISO 1.600 even on mFT system. On the other hand i’m mainly a landscape and architecture photographer and i would capture a landscape with higher ISO settings. But if you need the best low noise performance like for astro images you are better off with a full frame system. But what about the image quality you can reach with both systems. First of all the sharpness of image is determined with the lens, and good lenses on mFT systems will cost and are not cheap. 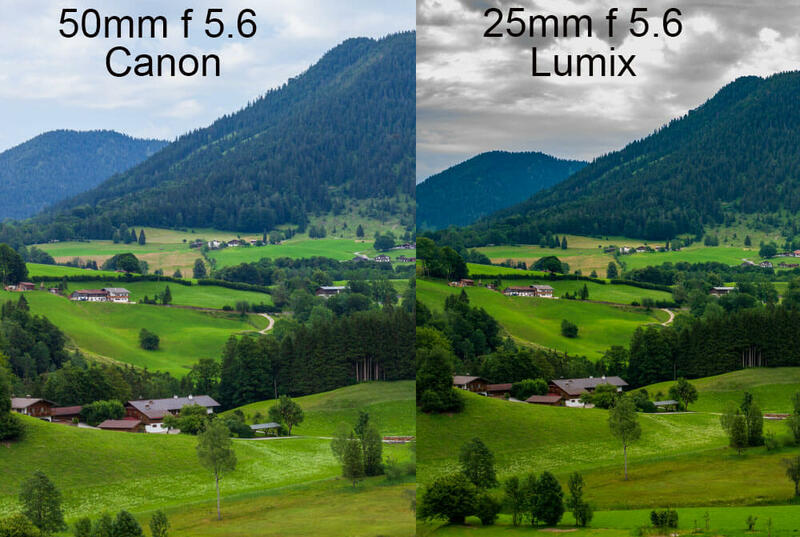 Panasonic has some good lenses like for example the 12-35mm/2.8 which is the same (from focal range) like the Canon 24-70/4.0. So i did a comparism with both lenses. I merely can state any differences, at least there are no difference where you could tell oh that is the full frame imageand that one is from an mFT system. As a further pratical comparism i show you an image captured within 1 hour and without any tripod (just did corrections for the image sections). There is almost no difference too me at least no differences in image quality which will force you to a full frame camera and i could print out both images to 50x70cm. Once in a while i do some short video clips and this is an ease with the Lumix cameras, both the G6 and G81 compared to the Canon camera. Just for example this little clip from a butterfly. The AF follow function is just great and stabalization in the camera body improves those clips a lot. If you’re looking for 4K video at 60fps you have to buy a G9 or even the GH5. But on video Canon lacks a couple of features like the mentioned 60fps on 4K and that is true for the Canon5D MK IV and even the newest EOR-R. And not to forget all 4K clips are cropped. Overall we can state that mFT is better than its call. Such a system saves a lot of weight, offers most of the time more features implemented in the body and the differences in image quality are negligible if you’re high quality lenses. With high ISO settings you have to be a bit careful and extreme image processing like brightning up the shadows a lot a full frame camera would be the better choice. But anyway in the past i’ll get myself more and more often the mFT system. What experiences did you make or did you make the switch from a full frame system ot a mFT system (Panasonic or Olympus). Just le me know and write your questions/experiences in the comments.